Pringles' slogan is pretty convincing -- the whole "once you pop you can't stop" thing. (And it could have something to do with the insanely high sodium level, but that's neither here nor there.) One woman, however, seems to have taken this slogan as a legal guarantee, not a great bit of branding. Let us be very clear on this: People can definitely make you stop. 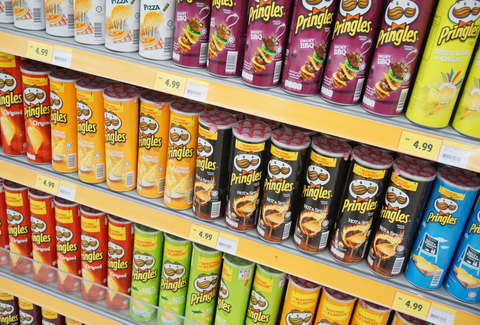 A 25-year-old Irish woman is going to serve a two-month prison sentence for opening a Pringles can in a store, according to a report by Mirror, and she now knows this better than anyone. She'd been previously banned from the store, and opened the can because, in her view, they'd have to let her pay for it. This was not the case. According to a BBC report, the crime took place on December 27, 2016 at a Tesco in Cork, but she only recently saw trial. As the woman was on her way to the self-checkout area with the €1.50 can, she was confronted by staff about the whole being banned thing. So she opened the can and responded, "I opened it so you have to leave me pay for it." In fact, she had just damaged the product. While Mirror reports that her defense asked for leniency because she's five months pregnant and a newlywed, the judge kept in mind a history that included 14 convictions for theft. The judge acknowledged that "out of context the offence could look on the lower end of the scale in terms of seriousness," but still opted for a four month sentence with two months suspended. The judged added that it was hard to see her actions as anything but "smart Alec behavior."